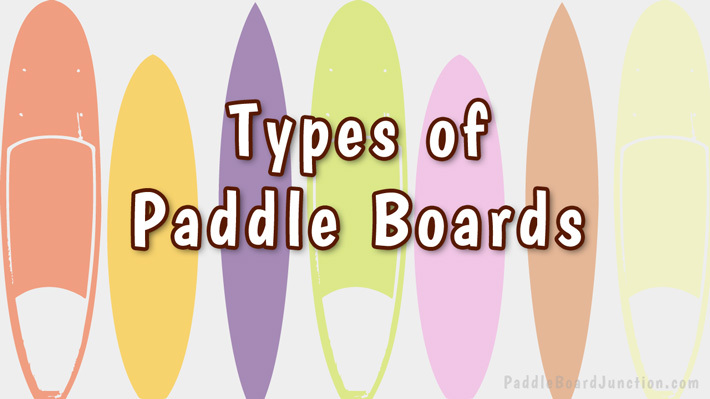 There are many types of paddle boards out there, and it can get confusing as to which one is best for you. Board types vary according to what you use them for, such as surfing or racing. There are even paddle boards specific for fishing and yoga! The main types of paddle boards for different uses are: all around, surfing, flatwater, racing, and touring. There are also two types of board construction: solid and inflatable. 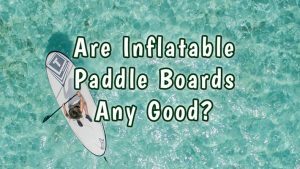 Before you research the different types of stand up paddle boards, you must know the differences between inflatable and solid SUP’s. 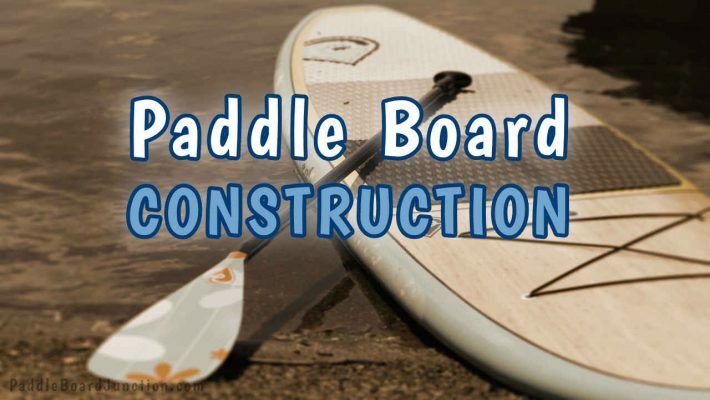 Solidly constructed paddle boards are built from a range of materials: fiberglass, foam, kevlar, plastics, and wood. You waste no time inflating the board and can get straight out on the water. These boards are super stable, and can withstand strong winds and choppy waters. Solid SUP’s generally have better performance than inflatable SUP’s regarding speed and agility, or for tricks while surfing those waves. In contrast with solid SUP’s, inflatable boards are made from layers of PVC plastic with woven fibers connecting to the top and bottom of the board, which actually make the board very rigid once fully inflated. Inflatable SUP’s (or “iSUP’s”) are generally a little lighter than most solid boards. These boards require minimal storage space and can pack down very well into a backpack. Inflatable boards are optimum for traveling abroad, as they can easily fit into a suitcase. They are easily transportable, and good especially if you want to paddle in a location that is not easily accessible with a car. Inflatable SUP’s are generally less expensive than their solid counterpart. The all around paddle board does what it sounds like – it is a board good for just about anything. Usually the all around boards are shaped with a concave, rounded nose. 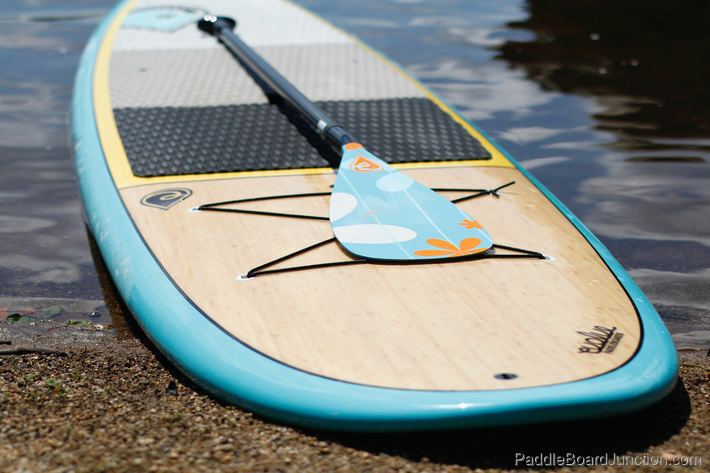 This is the type of board you want if you’re looking for a very versatile, family-friendly SUP. All around SUP’s, although they are very versatile, are best used for occasionally riding small waves or cruising around some flat waters with the family. Ultimately, if you’re keeping your eye out for an all around board, you want something that will stay balanced on flat waters and also something that will have good performance on the waves. These boards can also be enjoyed by all members of your family, from adults to kids. All arounder’s are great for beginners, but can also be used by people of any skill level. Also, if you don’t have a specific purpose for your paddle boarding adventures (such as yoga, fishing, or performance surfing), an all around SUP is most likely the board for you! Surfboards aren’t the only contraptions you can use to catch those massive waves! Some stand up paddle boards are actually made specifically for surfing. Surfing SUP’s can be long or short, depending on the type of surfer you feel that you are. Short boards are better for smaller, lighter people and can move quicker and have a faster reaction time to your movements. A longer board supports heavier people and can be more stable, easily cutting through waves. 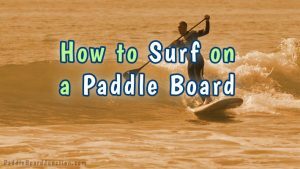 Keep in mind that short boards require bigger waves in order to ride them, can be hard to balance, and you may need to keep paddling just to stay afloat! Surf paddle boards are also less rounded at the nose, providing a better construction to cut through waves. Bear in mind that the board’s length, width, and thickness all play a part in its balance, stability, and performance. Flatwaters are any body of water that has minimal movement, such as a calm lake or pond. Flatwater stand up paddle boards perform well in these types of waters, as the name suggests. 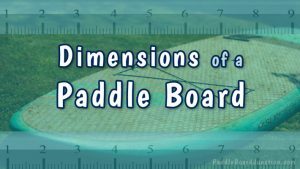 Flatwater boards are very similar to all around boards, except for the fact that flatwater boards generally do not perform well for wave riding or choppy waters. 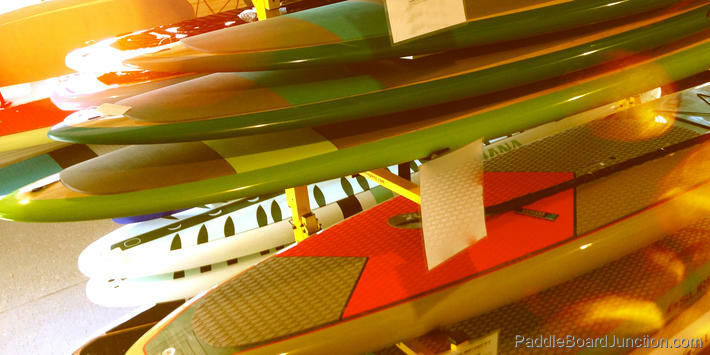 Flatwater boards can be solid or inflatable, depending on your preference. 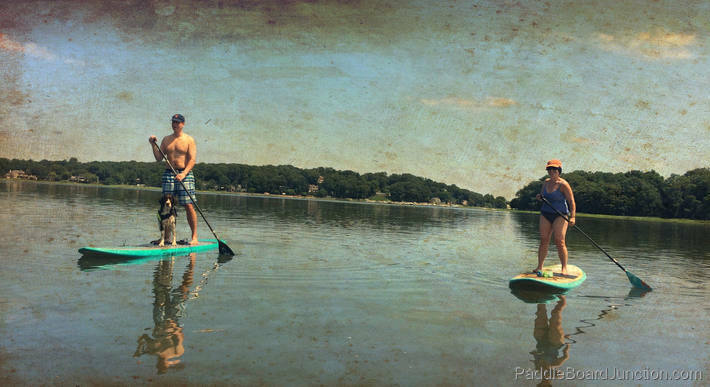 There are also different activities you can partake in while on a flatwater SUP, besides just enjoying the peace and scenery of a lake or pond. You can also do yoga or go fishing! Yoga is obviously easier on a calm lake than in choppy, fast flowing rapids. 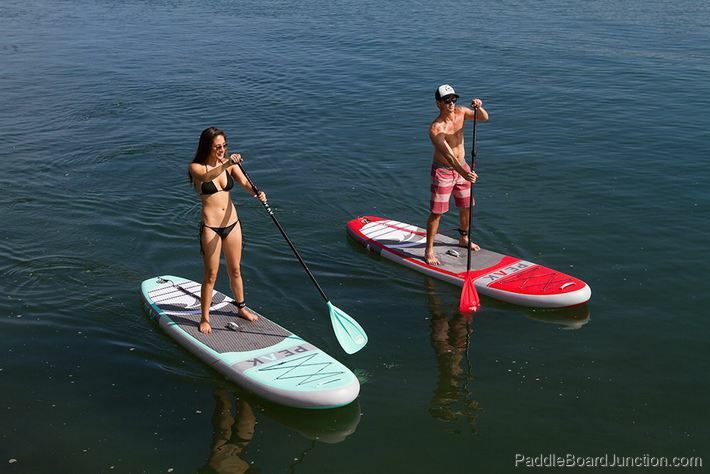 Flatwater SUP’s provide a stable platform for you to balance on while busting out those yoga moves. A good way to make sure the flatwater SUP doesn’t drift in the water while you’re doing yoga is to get some sort of anchoring system. You can buy an SUP anchor online, in sporting stores or you can make one yourself with some rope and a dumbbell! 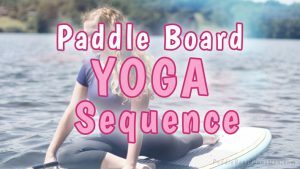 A nice paddle board brand to consider for yoga is the BOGA brand, which makes stylish and quality boards specifically for yoga. 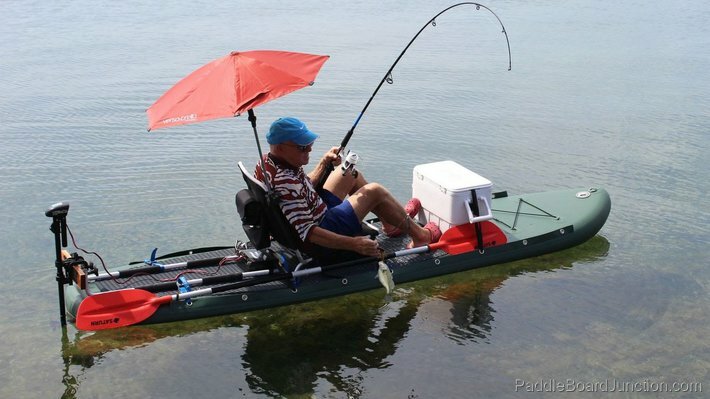 Fishing is a great hobby, and flatwater SUP’s make fishing more convenient. Just grab your board and a pole, and get out on the water! Similarly with yoga, an anchoring system is convenient to keep you stable while you’re out fishing. There are also many accessories for fishing on your board, such as deck chairs and tackle storage. It is good to get a board with a lot of deck space for coolers and storage while fishing. 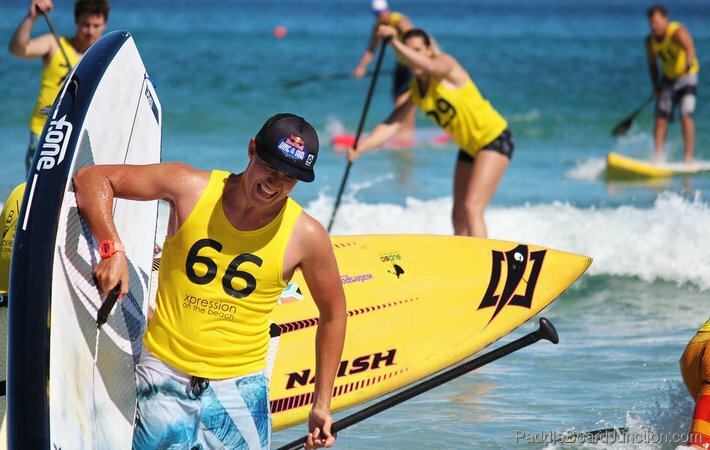 More advanced paddlers get into SUP racing, which is becoming a bigger and more popular sport. Luckily, these racers have SUP’s specifically made to go fast and win those intense races. Touring boards are made for long distance explorations of your favorite vacation destinations. You ultimately want a board that is stable and versatile, being able to handle both flatwater conditions and choppy, fast-flowing rapids. You never know what kind of waters there will be on your adventures, and you want a board that can handle it all. Hopefully this info will help you in your quest to find a suitable paddle board, whether it be for yourself or for the whole family! Have fun and happy paddling!